Times Square Proposal Man drops ring down subway grate. Taken from The NYPD Twitter feed. If they had hired me to shoot their proposal, the first thing I would have suggested is not to propose over a street grate. 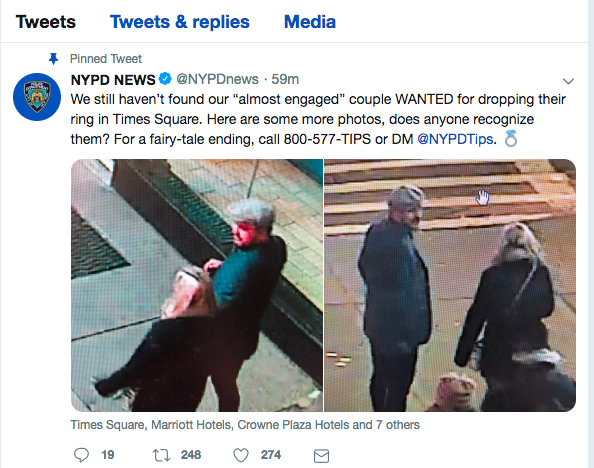 Leave it to the NYPD to turn Big Brother surveillance into a love story. I hope they find their ring! A man proposing outside the Times Square Olive Garden accidentally dropped the ring into a utility grate. Now the NYPD would like him to come pick it up, please. Just before midnight on December 1, a man proposed to his girlfriend on a busy sidewalk in Times Square. She said yes, but a video released by the NYPD shows the man dropping the ring into a grate. According to The Washington Post, the couple then turned to nearby police officers for help, but since there wasn’t much to be done, the pair ended up leaving without filing a report or even giving their names. 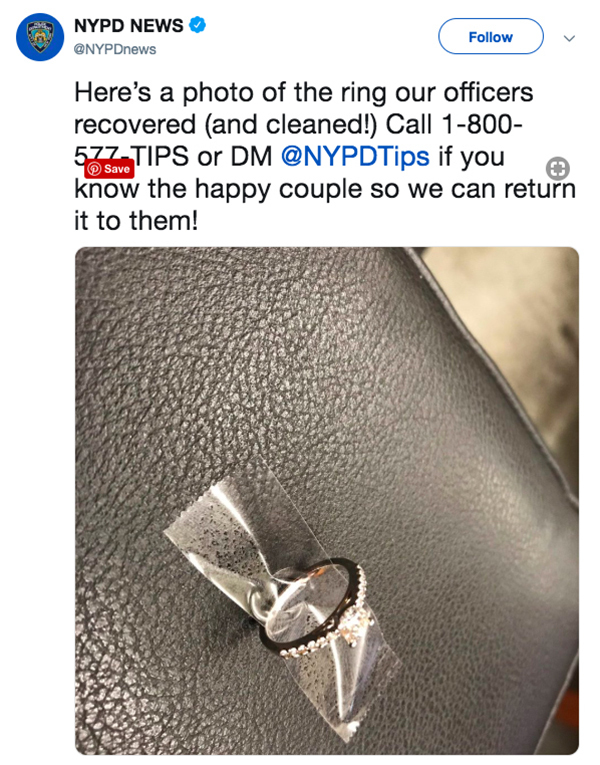 But the good news is that the NYPD has the ring. They even wiped off all the subway goo and polished it up. If you’re the Times Square ring bumbler, come pick up your litter.